I live to travel. It is when I am at my happiest. We live in a diverse and beautiful world and in my short time here I plan to see and experience as much of it as possible. I can think of nothing better than hopping on a plane and landing in some new and exotic place, far from home and ready for adventure. I have always known travel comes at a high cost to our environment, but I’ve tended to ignore that fact. I was dreading our ‘Living Sustainably’ lecture on travel. I knew it was going to be confronted with a list of reasons of why travelling is a bad thing. I was right. ‘Hopping on a plane’ massively increases person’s carbon footprint. Approximately 20% of an Irish household’s carbon emissions are due to air travel. This is a huge figure. Emissions from flying can range from 140g to 260g CO2 e per passenger km-1. I travelled to Tanzania last summer. My flight over, via Amsterdam, released in total 1,100kg of CO2 per passenger. I also flew from Dar Es Salaam in Tanzania to Lilongwe in Malawi. This flight emitted 176kg of CO2 per passenger. Finally my flight home, via Johannesburg and Paris, released a staggering 1,400 kg of CO2 per passenger. In total, it increased my carbon footprint by 2,676kg of CO2. This colossal amount of carbon emission could have been avoided if I had simply stayed at home. Some say travel is a luxury, and perhaps a luxury we can no longer afford. It is ironic that every time I travel I am helping to destroy this magnificent world that I am travelling to see. Our lecture left me troubled and so I decided to focus my blog post on it. Should I have stayed at home? No. I don’t think so. Living in Tanzania this summer is something that I could never regret. It was a massively educating and defining life experience for me. I have never felt as alive as I did there. I learned to live a totally new way of life. I met people I would never have otherwise had the chance to meet. They taught me to look at my life in a completely different way. It is something that I hope everyone will someday get the opportunity to do. It is a cliché to say that travel ‘broadens the mind’, but it is a cliché for a reason. However, we cannot ignore the huge impact these ‘mind-broadening’ experiences have on the environment. So what can be done? We can attempt to cut down our footprint in all other aspects of our life. When travelling we can try be as ecofriendly as possible. However, doing these things will never fully negate the true cost of a flight. What I think must be realized is that you do not have to fly to travel. There are a huge number of other alternatives that are overlooked. It is true that these alternatives will take longer, but they are also usually cheaper. And hey, getting there is half the fun! For overland travel not enough can be said about catching the train. Taking the train can cut passenger emissions by up to 90%. You can reach practically any country in Europe from the UK by rail. Unfortunately, the same cannot be said of Ireland, but the UK is only a ferry ride away. People are also quite unaware of how well connected Europe and Asia are by rail. Many of the rail routes are tourist attractions in their own right, not simply a means of getting somewhere. 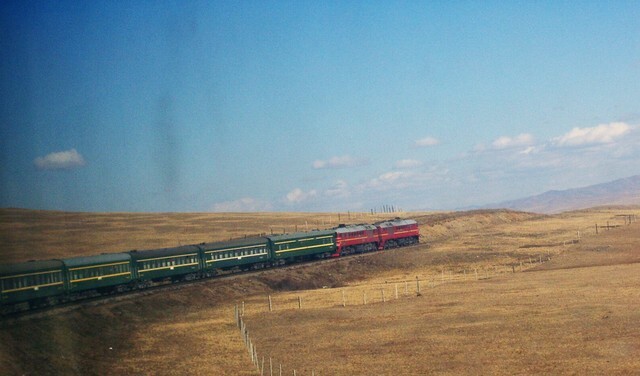 Famous railways, such as the Trans-Siberian Railway, the Jungle line in South-East Asia, and the Palace-On-Wheels in India, attract thousands of travellers every year. What better way to view a country than by watching breathtaking landscapes, and sprawling urban centers fly by your window. And what if there is no rail route? Well there will always be a bus. I travelled from Arusha to Dar es Salaam by bus. It was a ten hour journey. This will probably conjure up horrific images of cramped conditions, no air-conditioning and potholed African roads. However, I must say I thoroughly enjoyed this journey. Yes, things were not as spacious and airy as they could have been, but on this trip I bonded with many other travellers, listened to African chants being sung to pass away time and chatted with locals about their lives and their reasons for travelling. I would have missed out on a lot if I had taken the plane instead. Travelling by sea can be a bit trickier. Ferry timetables can be more infrequent than trains or buses and prices can be quite expensive. However it is definitely worth considering the option. There are myriad of transatlantic passenger ships, along with ferries to the Mediterranean, Scandinavia and even West Africa. Like train travel, a boat trip can be a once in a lifetime experience as well as an effective way of cutting carbon emissions. I hope I’ve encouraged the reader to consider these other options. Longer journeys can seem like an inconvenience, but they can also be some of the most rewarding parts of a trip. After college I plan to go to Beijing. I also plan not to take a single foot off the ground. I will go to the UK with the ferry and then take the train through Europe to Moscow. From here I can get the Trans-Siberian Express to Beijing. I will follow the old Silk Road on the way home, taking advantage of China’s railways. I will bus through Central Asia, then catch a train from Kazakhstan to Moscow and begin the homeward stretch through Europe. Direct travel expenses, train tickets etc., will cost me no more than €1,500. For this price I will get to see the diverse countryside of Europe, the vast wildernesses of Siberia, the steppes of Mongolia, the Great Wall of China, the foothills of the Himalayas, the hidden valleys of Central Asia, the Gobi Desert. I will share train Cabins with people from all over the world and make friends along the way. I think of nothing more thrilling. All the while my trip will have minimal adverse effects on the environment. How can an impersonal flight to Beijing and back again compete with this? I do not think travel is luxury. It is a necessity. It changes your perspective on life. It gives you respect for other cultures and appreciation for the world you live in. It dispels ignorance and encourages tolerance and acceptance. It is the way we travel that is the luxury. When commercial flights became available, we lost one of the crucial and beneficial parts of travel, the journey. In this article I hoped to renew some appreciation for this part of travel. If more people began to use alternative options, think of the effect it could have on our world. Flights would increase in frequency; new ferry and train routes would be established. This could have a profound effect on the world. 20% of an Irish household’s footprint is due to air travel, and this is only a measure of fuel used, indirect costs could be extremely large too. Please check out the excellent websites, such as http://www.seat61.com/, http://alittleadrift.com/ and http://www.busstation.net/index.htm, can help you to plan train and bus journeys all over the world and give advice on travelling without flying.